Mort Kunstler Handsigned and Numbered Limited Edition Giclee on Canvas:"Swords into Plowshares"
About the Art: Two weeks before the surrender at Appomattox Court House, Lincoln stated that all he wanted, when the time came, was "to get the men composing the Confederate armies back to their homes, at work on their farms or in their shops." A victorious President Lincoln pledged to restore the South to the union "with malice toward none." On April 14, 1865, however, Lincoln was mortally wounded by assassin John Wilkes Booth while attending the theater in Washington. Vice President Andrew Johnson became president, and without Lincoln's leadership, a long harsh era of Reconstruction awaited Southerners. For many Confederates, anticipated joy at going home changed abruptly on arrival to heartache. Returning planters and their progeny came home to poverty instead of plantations. 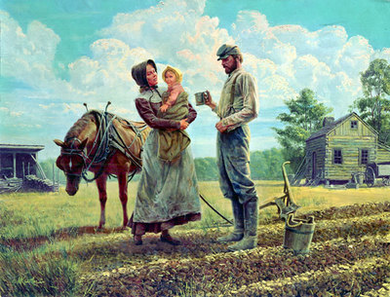 Yeoman farmers came home to patches of land barely kept going by the hard work and sacrifices of wives and children. Secession had cost the South one-fourth of its white men between eighteen and thirty five years of age, two-fifths of its livestock, half of its farm equipment, and two-thirds of its total property. Yet the survivors went to work, cheerless but determined, to salvage as much as possible form the wreckage and to build a better future. Such was part of the cost of keeping intact the nation Lincoln considered "the last great hope of earth." In the words of a returning Union solider, "From those who have lived to return home comes no words of regrets. They are content their duty is done. What matters the loss of all these years! What matters the trials, the sickness, the wounds! What we went out to do is done. The war is ended and the Union is saved!" After four years of bloody conflict, the War Between the States was over.